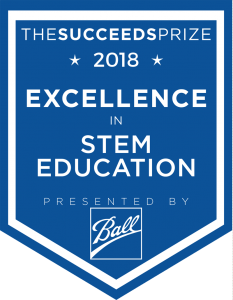 The Succeeds Prize, Colorado’s most prestigious awards and recognition event honoring transformational public schools and educators, is seeking applications for its 2018 Excellence in STEM Education Award. This statewide award, organized by Colorado Succeeds, 9NEWS, and mindSpark Learning, seeks to recognize and support outstanding examples of STEM education across the state. By 2020, 55% of the top jobs in Colorado will require skills in Science, Technology, Engineering, and Math (STEM). Yet, currently, Colorado is filling STEM jobs by importing qualified talent from outside the state. STEM career pathways also tend to have low percentage of workers who are women and people of color, even as Colorado grows more diverse. The Succeeds Prize recognizes that educators across the state are working to provide students with meaningful STEM learning opportunities that will prepare them to enter and succeed in STEM careers. The STEM Award is intended to recognize examples of what is working in STEM education in Colorado and provide examples that educators across the state can learn from. The winning school will receive a $15,000 cash prize to supercharge their efforts. The winner will also work with Colorado Succeeds, 9NEWS, and mindSpark Learning to share the story of their success with educators, policymakers, and businesses from across Colorado. Eligibility: All Colorado public schools, traditional and charter, are eligible to apply for this award. Applications are due by March 23, 2018. Learn more and apply here! The winner will be announced at The Succeeds Prize live reveal celebration on Tuesday, Sept. 18, 2018 at the Ellie Caulkins Opera House at the Denver Center for the Performing Arts. For information about the awards, sponsorship, or tickets to the event, visit TheSucceedsPrize.org or contact info@thesucceedsprize.org. The Succeeds Prize is the most prestigious awards and recognition event for Colorado’s public schools and educators. It honors the transformational impact Colorado’s public schools and educators are leading across the state. In addition to Colorado CEO’s announcing the winners at the live reveal, The Succeeds Prize also serves as a year-long campaign to identify and scale successful innovations and best practices so every student in Colorado can benefit. The Succeeds Prize is sponsored by the business community in partnership with Colorado Succeeds, 9NEWS/KUSA, and mindSpark Learning.